1. Place a large pot full of water on the stove and bring the water to boil. 2. In the meantime, add a bit of olive oil to the skillet and heat the skillet over high heat. Add the garlic cloves (do not chop or peel) and cherry tomatoes cut in half. 3. When the water boils in the pot, add salt and spaghetti. 3. Take out the garlic after the oil absorbs some of the flavour (after about 1 minute). Add the prawns to the skillet. 4. 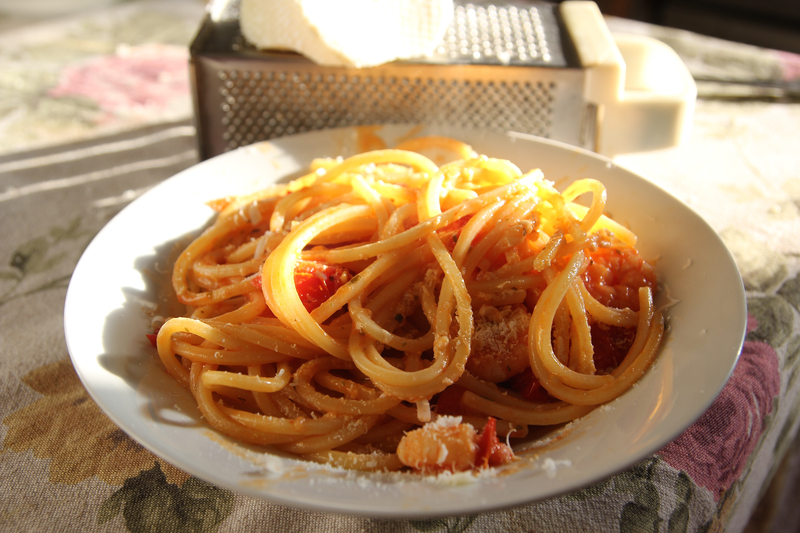 Add salt, a bit dried oregano and a bit of boiled water (from the spaghetti pot) so that it creates a creamy sauce. If the prawns are drying out add a bit more water and oregano. 5. Drain the pasta after about 6 minutes. It should be very al dente. 6. Add the pasta to the skillet. Stir everything together. 7. Divide the spaghetti, creamy tomato and prawns into to plates. Drizzle pasta with a bit of extra virgin olive oil and sprinkle with finely grated ricotta salata. Enjoy!